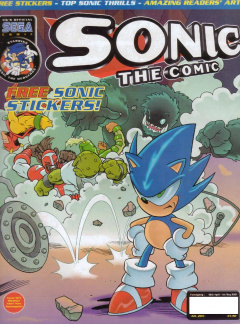 Sonic the Comic #205 is the two-hundred and fifth issue of the Sonic the Comic series by Fleetway Editions Ltd.
Speedlines: Sonic answers questions from readers regarding fan characters, Amy Rose's species, the name of the Nameless Zone, and a potential girlfriend for Knuckles. This would be the final issue to include the Speedlines feature. Graphic Zone: Fan art submitted by readers. The theme for this issue's Graphic Zone is "Super Sonic Special", featuring a collection of drawings exclusively featuring Super Sonic. Owners of the printed art each won a Sonic the Hedgehog watch.